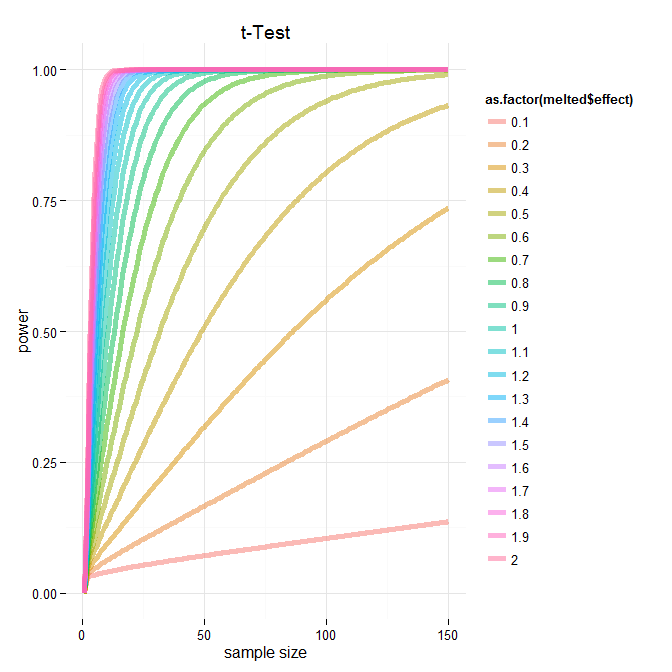 I was interested in modeling the relationship between the power and sample size, while holding the significance level constant (p = 0.05) , for the common two-sample t-Test. Luckily R has great support for power analysis and I found the function I was looking for in the package pwr. To calculate the power for the two-sample T-test at different effect and sample sizes I needed to wrap the basic function power.t.test(). The object t.test.power.effect is 150 x 20 column data frame which lists the power for from 1 to 150 samples and effects sizes from 0 to 2 by 0.1. While this is useful as a look up table we would optimally like to see a visualization of it. Here is some example code to plot this data using base and ggplot2 packages. Which makes the following graph. 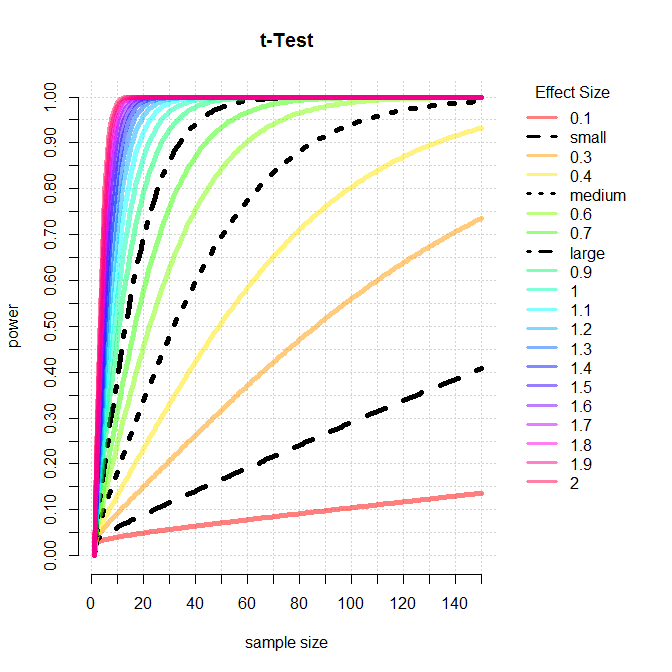 Based on this graph, we can see the relationship between power, effect sizes and sample number. I’ve marked the cutoffs suggested by Cohen 1988 delineating small, medium and large effect sizes. Based on this we can see that if we are designing an experiment and are trying to select a sample size for which our test will be powerd at 0.8 we need to consider the expected effect of our experimental treatment. If we think that or treatment should have a moderate effect we should consider some where around 60 samples per group. However and even better analysis would be to directly calculate the sample number needed to achieve some power and significance level given experimentally derived effects sizes based on preliminary data! And just for kicks here is the same data plotted using ggplot2. A little tweaking and these graphs are basically the same. Wow I really need to stop using base for my plots and fully embrace learning ggplot2! And here is the gist if you want the source code. To leave a comment for the author, please follow the link and comment on their blog: imDEV » R.